Star Holdings International, Sri Lanka’s household name for innovative fabric care recently launched its Detergent Soap ‘Lemon Katay’. Revolutionising the field of fabric care once again, this 120g detergent soap is marked at an affordable price of Rs. 30 and has been religiously adorned with a vibrant and tropical colour scheme – making it a tough resistance not to grab this pillow packed beauty off the shelf. With few of the product’s major plus points being exclusively free of animal fat, and boosted with special chemicals enhanced to remove dirt faster – this innovative product is expected to create a stir – standing second to none in the market. “We hope to keep flooding the market with products likes this – that contain mind blowing technology and excessive research to help our valued consumers spend less time choosing and more time buying,” he added. The elaborate launch ended with a spectacular 1st leg of the “Chairman’s Trophy” awards ceremony, as an array of trophies were presented to the company’s best Sales Rep, best ASE, Best ASM & Best Distributor. In a bid to boost the morale of the sales force in a competitive market – the awards ceremony will be hosted in three parts: with its finale expected to take place next year in a grand ostentatious event. “This will not only serve as a motivation to the force to interdependently achieve the company’s vision but also as an acknowledgement to those who really put their heart and soul into what they are doing. This for me, is sweet success,” Haputhanthri said. 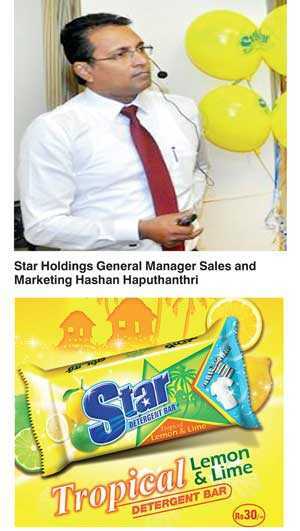 Star Holdings has been a primary part of Sri Lanka’s local market for the past 30 years. With its consistent and established presence - Star Holdings has brought to the market innovative products that were always economical for every household. Built on a three-acre block of land in 1996 with state of the art facilities, Starlight was established on the vision of creating products on a “Value For Money” basis with the consumers’ best interest at heart. Starlight has grown to become a leading competitor in the market and is one of the few names that are instantly recognised as a true Sri Lankan brand.